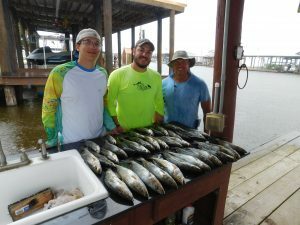 This week I had a group in from Nashville Tennessee to stay in the log cabins and they wanted to do some speckled trout and red fish fishing charters. We started off Monday morning at daylight with a very light wind out of the northeast at about five miles per hour. After getting the boat ice down and loaded up with all the gear we headed south across Barataria Bay towards the barrier islands where we been catching some nice speckled trout. We arrive at the first location right at the time the trout could start to see well enough to start feeding. 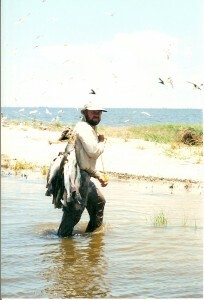 We were fishing on top of an oyster reef in about four feet of water using live shrimp three feet under a popping cork. The clarity of the water was not too good as we caught a few trout from reef to reef. Never did really get on a strong bite but we did manage to box up thirty-one beautiful speckled trout. 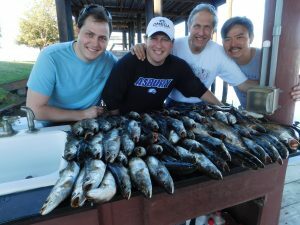 The anglers that was on the boat had a wonderful time and that is what it is all about. At about ten o’clock the bite was about over with for the morning so we decided to put some wind in our face and head back across the bay towards the camp and get out of the sun ourselves. Upon arriving back at the cabins, we all pitched in and did our part in all the post fishing activities. It didn’t take long and we had the boat clean as well as the box of fish and was sitting in the shade talking about all the things that happen during the fishing trip. Another one of those fishing trips that will be marked up as a good trip. On Tuesday morning, what looked like a carbon copy of Monday morning regarding the weather conditions. I pulled up to the log cabins at around five thirty in the morning to pick up the clients with one thing in mind and that was to find some more of those beautiful speckled trout. 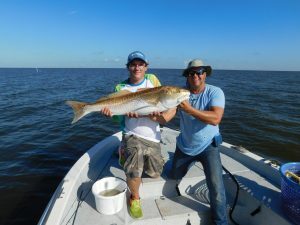 We headed back across Barataria Bay in search of some of those big yellow mouth mules we caught the day before. Just as soon as it was light enough for the fish to see we started catching the very fish we were in search for. Their tails were all rubbed raw form stirring up the eggs off the bottom. When the females lay their eggs and they sink to the bottom it is common for them to stir them up using their tails so the males can swim by and spray them to fertilize them. This is the time of the year that this practice takes place. In the process of catching another box of beautiful speckled trout both of the guys could put one of those big bull reds in the boat for a photo session. Anytime someone catch’s one of those Hugh bull reds I always like to get a photo with them and their bull red and throw the fish back in the water to fight another day. This is the breeders for the red fish and, they are no good to take home and clean them to eat. The meat is too thick and the blood line is too wide. After thirty-five beautiful speckled trout and three bull reds we put the boat in the wind and headed north back towards the cabins. The guys were a big help when we got back to the camp as they helped me to clean the fish and get the boat ready for the next trip. Well here comes Wednesday morning the final day on the water for me this week and I woke up to the sky rumbling and stumbling with severe weather. I looked on my phone and it was coming from the south, the same direction we were headed to go fishing. We sat under one of the log cabins while it passed by and sure enough about seven o’clock it cleared up and we headed out. It was a dark morning with all the weather we were having so it didn’t look like we were going out too late. When we got to the spot we had been catching fish for the last two days the water clarity was not good at all. After checking out a few oyster reefs in the area I decided to head west towards a place we call Grand Isle. As we traveled to the west I notice the water clarity was getting better and better as we went along. By the time we arrived at one of the locations I normally fish in that area the water was beautiful and the fish were hungry. We went to work catching speckled trout one after the other. At one time, it was all I could do to keep up with those guys pulling trout over the side of the boat one after the other. The dolphins move in on us and had to move the boat however it seemed like the speckled trout were everywhere. I had to share three spots with the dolphins that day because it seemed like every time we pulled up to a spot and started catching trout here came the dolphins. Well we didn’t get mad at them because if you were to stop and think about it, those locations belong to them more than they belong to us. They were simply eating the same fish we were trying to catch. We had a lot of fun on the water those three days and made a lot of good memories. We also took a lot of photo’s so the guys could go home and show their families and friends. I am sure the stories may get stretched out a little bit by the time they are told back home and in the office, but then again that is part of having an enjoyable time on the water. Always remember this safety first while on the water and always look out for any weather developing while you are out in open water.